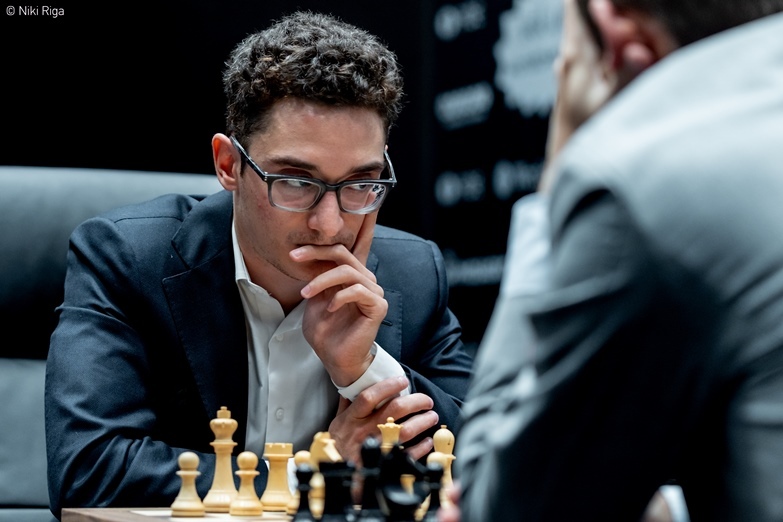 It’s three games, three draws in the 2018 World Chess Championship match in London, with Black the side pushing at the end of all three of them. 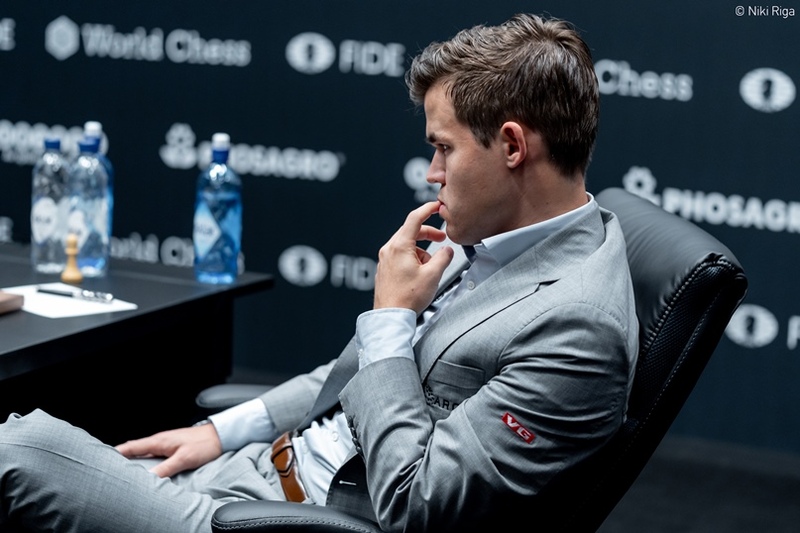 On this occasion both players had ample reason for regret, with Magnus Carlsen giving the one-word answer “nope” to the question of whether he was satisfied with the outcome of the opening. 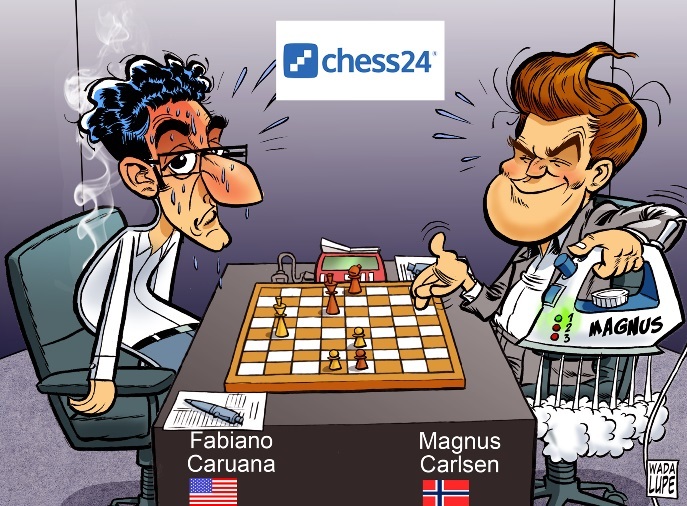 Fabiano Caruana got a significant edge, but then threw it all away in one careless move. After that he was made to suffer, but not too much. As he said at the post-game press conference, “I think that Magnus could have tortured me for a bit more”. He would probably scoff at me if he heard me, but I belong to, at least in spirit, the Kramnik school of analysis, which basically says, "you determine what the starting position of your analysis is, and then at every turn you list all the moves which make some sense and analyse them for at least a little bit". Grischuk felt it might have been worth calling the World Champion’s bluff and grabbing the pawn, but after 10.Nbd2 Fabiano also maintained control of the position, with Carlsen’s 10…Bg4! ?, preparing to give up the bishop pair, far from an obvious decision. ...he hurriedly played 15.Bd2? !, and after 15…Raa8! Black suddenly didn’t need to concede control of the a-file. Instead after 15.Rxa5! Qxa5 16.Bd2! Qc7 17.Qa1! White would have had a very pleasant advantage. Clearly after Qa1 Black is nowhere near equality. It might not be so bad since the black position is fairly solid, but I’m not going to equalise the game anytime soon. There was absolutely no reason to be satisfied. I was just in for a long day, and then obviously I was much happier. The thing with such inaccuracies is not that the inaccuracy itself is a big deal, but it's usually a sign that future inaccuracies, or mistakes, or blunders will follow. I would say there are two variations, in my opinion, because Fabiano’s play is very much depending on form, much more than Magnus. His level is very different when he is in good form or not. If he is not in good form then he has little chance, in my view, because even being in good form it’s still difficult to beat Magnus! Not at your best, it’s practically impossible. But if he gets into his best form… then I believe he has real chances. When he’s on a run he’s extremely strong. If everything starts to go for him he’s an incredible calculator – in calculation, I think he’s probably the best. If he gets his type of game, he gets confident and in good shape, then probably for me he would be a slight favourite, but very much things are depending on his form, and so far we have to admit that he’s not yet at his best. Svidler: It's this weird situation where nothing is really threatened, but you still dislike your position and would like to have a plan to do something. Grischuk: The P-word. I think Gustafsson doesn't allow people to use the word plan in a chess sense. Actually I completely agree with him! Plans do not exist. There are some ideas, they exist, and then when you've played lots of ideas in the game you can say, “ok, this was my plan”, but not beforehand. It's like, what is your plan in life? It's impossible to answer until your life actually happens. I really just wanted to give him the choice on move 40 of whether to take on c5. That was my thought here, but I suppose there was no real reason to provoke a crisis in the position quite yet. Fabi still had five minutes on the clock and correctly decided that he could play 40.Bxc5! He had no problem going on to draw after that, even doing it with a flourish by giving up his knight, since the black bishop was the wrong colour to aid the black h-pawn in queening on h1. Grischuk: It would be a funny thing if the first half of the match goes like this. Magnus presses with Black but then just plays for almost no reason at the end, gets tired and cannot do anything with White. Svidler: That would be an interesting cycle of non-violence. Grischuk: A couple more games like that and he will just revert to Karjakin's strategy of playing for a draw with both colours. Sopiko: Won't he be afraid of tiebreaks? Grischuk: Ok, usually people prefer a slow death to a quick one! Svidler: I don’t know if that’s true. Grischuk: It’s true, it’s true. Watch all those movies, like “please don’t kill me!” Ok, the guy knows he screwed up with the mafia or something, he gave away his secrets, he knows they will kill him, and still when he gets caught by them he starts to pray, “please don’t kill me, please don’t kill me”. It’s going to be fascinating to see how that goes, starting on Tuesday in London, when you can again follow the game here on chess24 with our commentary team of Peter Svidler, Sopiko Guramishvili and Alexander Grischuk!